France, Mexico Latest Nations Reportedly Spied On By U.S. : The Two-Way New documents leaked by former National Security Agency contractor Edward Snowden allege that the U.S. collected information from millions of French phone calls and tapped into the emails of Mexico's president. France has demanded an explanation. 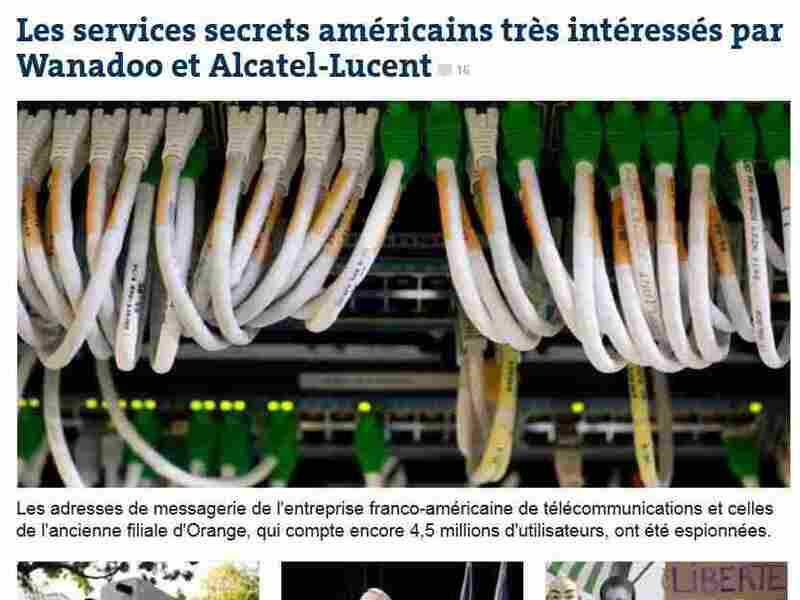 Le Monde has the scoop on allegations about NSA spying on French phone calls. -- France. "The U.S. National Security Agency recorded millions of French phone calls, including those involving individuals with no links to terrorism, Le Monde reported on Monday." That news comes from France 24, which adds that the report has led French officials "to summon the U.S. ambassador for 'immediate' talks." From Paris, Eleanor Beardsley tells our Newscast Desk that "French Foreign Minister Laurent Fabius has called in the American ambassador for an explanation." -- Mexico. The NSA's "Tailored Access Operations" division tapped into then-Mexican President Felipe Calderon's public email account in 2010, Der Spiegel reported over the weekend. The account, according to an NSA report, contained "diplomatic, economic and leadership communications which continue to provide insight into Mexico's political system and internal stability." As Der Spiegel adds, "reports of U.S. surveillance operations have caused outrage in Latin America in recent months. Brazilian President Dilma Rousseff canceled a planned trip to Washington five weeks ago and condemned the NSA's espionage in a blistering speech to the United Nations General Assembly.